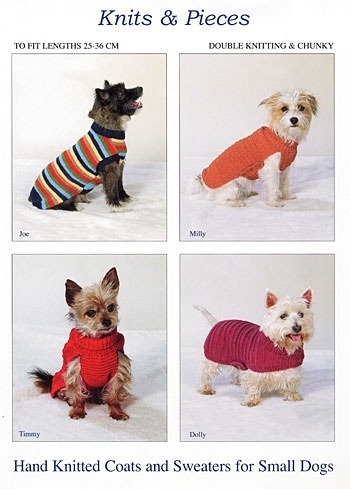 This very popular knitting pattern leaflet contains instructions to knit a collection of four well fitting coats and sweaters for your smallest best friend. There are two sizes, to fit small and medium sized terrier type dogs. The sweater is all in one, knitted in double knitting. The stripe design is useful for using up oddments of yarn but it would also look smart in one colour. This coat comes in three sizes, from a very small 25 cm length to medium Jack Russell size. There is side fastening for easy dressing. This simple coat is knitted in a chunky yarn. For extra snugness, another simple belt could be added, knitted about 9 sts wide in garter st . All the coats can be adjusted at the waist to fit individual back lengths.